Just what is Go2? How do I use it? How may I list my property on Go2? Find out the answers to these questions, and more, in this, our easy to use 'FAQ' page. Just click on one of the questions below to see the answer. Go2 allows you to find self-catering holiday lets, lodges, and cottages by searching through a catalogue of thousands of properties. We've gathered together a great range of properties provided by a number of companies, as well as those which owners list directly on Go2. Think of Go2 a little like an electronics store for holidays. We 'stock' a range of products from a range of companies and act as a shop-front for their products. You may search for what you want, and when you find it order it from the 'manufacturer'. In our case the products are holiday lets, and the manufacturers range from private owners right up to the largest of companies like Hoseasons. In addition to this, Go2 also provides search and comparison of thousands of hotels, travel guides and camping information. So whatever sort of holiday accommodation you're seeking, Go2 will help you find it. We made Go2 because we had a need for it. The internet is a great means for finding things, including holidays, but we became increasingly frustrated by its fragmented nature. Looking for a holiday let became something of a chore of using search engines to find different sites, visiting those sites, using their search facilities to look through what they provided, heading back to the search engine, finding another site, using their search facilities... and so on, ad infinitum. We thought... surely there must be a better way? Why can't we go to just one site and search through the properties provided by a variety of different holiday companies, or individual holiday let owners, all in one place? Wouldn't it be great if you just entered the search criteria once (town, county, minium number property sleeps, travel dates etc), did a search, and knew that you were getting results gleaned from many different companies and providers...? Wouldn't it be great...? It would. And that's just why we built Go2. To do just that. And that's what makes Go2 great, for at Go2 you can indeed search, from one place, through a range of holiday companies' products, as well as private owner lets, making it easy to find what you're after... and taking much of the time and stress out of the process. And if you need a bit of advice, check out the many reviews now provided... or better still, leave one for someone else to read! We hope you enjoy using Go2... because we've enjoyed building it for you. How many properties can I find on Go2? At the time of writing we have over 32,000 self-catering holiday lets listed on Go2 - probably the largest collection of UK and Irish properties on one website anywhere on the internet - and that number is constantly growing. This huge selection of properties is gathered from the largest of holiday companies, such as Hoseasons, Cottages4you, HomeAway and Sykes Cottages, through area specialists such as Imagine Ireland, Coast & Country Cottages, Holiday Cottages, Marsdens Holiday Cottages, Norfolk Country Cottages and Blue Chip Holidays, right through to independent owners who advertise directly on Go2. When you search using Go2 the search results will include properties from any or all of these companies. How do I search for properties on Go2? Just use the panel on the left of the Home page to enter your search details (click the Home button or the Go2 main logo to get to the Home page). You can enter a country, county or town name (or leave any or all blank) and even the property name or reference if you know it. You can also enter the minimum number the property should be able to sleep and also enter the dates you wish to travel between if you want to check which properties are available. Finally, the Name/Ref/Phrase box can also be used to search for any phrase within a property description, so if you'd like to find any properties in the Cotswolds or New Forest, for example, just type that phrase in the Name/Ref/Phrase box. When ready just click the SEARCH button. When you search using Go2 - for example for properties in Cornwall - the search results will include properties from any or all of the companies and private owners who have properties stored in our portfolio. You can narrow the results down by various criteria (eg. the number who can sleep in the property) and when the results are displayed you can sort these in various ways, for example by price (just click the top of the Price column at the right of the results grid). How do I view properties that I find on Go2? From the search results presented when you click SEARCH on the left panel, you can page forwards and backwards throught the results (if there is more than one page) by clicking the buttons at the bottom of the list. When you've found a property which interests you just click on its name and a full property details page will be displayed. How much detail is seen will depend on the provider of the property - some provide more extensive details than others. But usually you'll see the name, area, description, photographs, a map, and some information about the features provided at the property. In addition you can also check availability on the calendar provided. Should you require further information, or should you wish to book the property, just click the large button near the bottom of the page. This will redirect you to either the website of the property provider, or directly to their Booking pages (depending on who the provider is). Just click 'back' on your browser to return to the Go2 page. If you wish to share a property you like, or add it to your favourites, simply use the sharing buttons which appear at the top of the screen when you scroll down a page. These also provide options to print or email the details. What currency are prices quoted in on Go2? All prices listed on Go2 are in British Pounds as standard. However, you may see a price converted to another currency simply by clicking on the price in question (they are all shown as links). This will take you to the Yahoo! Finance website and display the price converted to Euros (from where you may select another currency to view the price in). As bookings for each property listed on Go2 are made directly with either the owner or the manager of the property, you will need to pay in the currency which they accept (as detailed on their website). However, most owners take payment via online credit card services and these will usually allow for conversion from other currencies - just be aware of any currency conversion charges which may be added on at the time. How may I list my property on Go2? To advertise your property on Go2 all you need to do is create an account and follow the instructions. Click the Create Account button at the top of this page, enter some details including a username and password and you're on your way! From there you can begin adding properties, entering their details, uploading photographs and updating availability data. Advertising on Go2 costs from as little as £25 per property per year, but for a limited period we're offering twelve month's initial advertising for free. That's right, nothing to pay for twelve months and no commitment to stay on after that period either. But if you do - and we trust you will - you simply pay for your first full 12 month's using our simple online Google Checkout payment service. Properties listed on Go2 benefit from a range of facilities to provide great descriptive content and feature lists, as well as multiple photographs, maps, and full availability data. We encourage our members to keep this data as up to date as possible, to benefit those who browse our website, and to this end we've worked hard to make the user interface of the property management and editing pages as simple as possible. Indeed you should find each section very straightforward to follow. 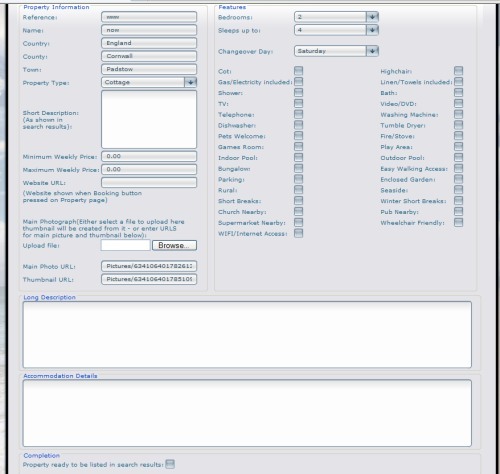 Once you've created an account, or each time you login using your username and password, you are taken to the 'My Account' details pages (see the My Account button near the top of this page), where you have pages for editing your main Account details, properties, photographs and availability data. Should you need assistance, or have a question you can't find the answer to, simply drop us an email at info@go2-holidays.com. We'll be pleased to help. How do I add and edit my properties Go2? On here you can enter the various details about your property. Be sure to include at least the basics of Reference, Name, County, Town, Short Description (for search results), Long Description, Pricing and so on. Also, don't forget the Website URL which will take the user to your website when they want to book your accommodation. If you have no website of your own, then simply provide your own contact info (email/telephone/postal) clearly within your property description. You can enrich your listing by ticking the features it has and by uploading pictures. Once you've entered enough information simply click the Save button. A listing will appear in the grid. You may edit again by clicking the edit button. At any time after entering property details you may click on the Preview button in the grid to see how the property will look when listed. Just click back to return to the 'Properties' page. When you're happy with the listing and would like to have it listed on Go2 simply edit the listing and tick the 'Property ready to be listed in search results' button at the bottom of the edit form. This tells us that you're property listing is complete and ready for review. We'll give it a quick check (usually within 48 hours) and then you'll see it listed in Search results. Should you wish to remove a property from Search results simply untick the 'Property ready to be listed in search results' button. Extra photographs may be uploaded for your properties on the 'Photographs' page, and availability edited on the 'Availability' page. Please try to keep this information as up to date as possible. How much does it cost to advertise on Go2? Advertising your property on Go2 is done on an annual subscription basis. The total cost of your subscription will depend on the number of properties you list. An initial fee will be payable at the start of each 12 month period, based on the number of properties you have listed in your Go2 account. However, you are free to edit, add and delete properties throughout the course of the year, and should an additional payment be due for the remainder of the term, this will be calculated according to the number of extra properties listed, and the length of the term remaining. Your account balance is calculated automatically and any fees due will be shown on the Account Details page when you login to Go2. Payment is accepted through the Google Checkout system, which provides a simple, and secure, method of online payment. You have 30 days to settle any outstanding balance, after which, if unpaid, we will not delete your account or properties, but simply set your properties to 'dormant'. This means that all the details remain on Go2, but the properties will just not be listed in any searches which users perform. On settling the outstanding balance any dormant properties will be reactivated. 1 to 3 properties - £25 each, including full description, availability editing and 1 main photograph. An extra (unlimited) set of photographs can be added for an additional £5 per property. 4 to 10 properties - £25 each for the first three (£5 for additional photos pack), then £10 each (all inclusive). Over 10 properties - as above for first 10, then £2 for each additional property listed (all inclusive). N.B. Properties listed before 31st December 2014 will benefit from a free trial period of 12 months from the date of joining Go2. Your account balance will remain at £0.00 until the end of this trial period, when charges will then become payable if you wish to continue to advertise (if you don't, your properties will simply become dormant). How do holiday-makers book one of my properties on Go2? Bookings are made directly through the property owner. Go2 simply provides an advertising and search mechanism to put the buyer and the seller in contact with one another. On each property listed on Go2 you can provide a URL (website link) of your own website which the buyer will be directed to when s/he clicks on the large Bookings and Enquries button at the bottom of the property description page. From here they will be able to contact you directly, either by email, telephone, or even by post, in order to check final availability and/or book the property. If you have no website of your own, then simply provide your own contact info (email/telephone/postal) clearly within your actual property description.